Cleaning, conditioning, and sprays are a huge part of your car detailing needs. 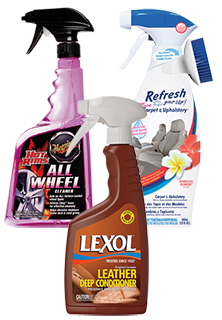 We have a wide variety of items including but no limited to Armor All, Eagle One, Sprayaway, Lexol, and more. You are sure to find what you are looking for to meet your detailing needs! We have the lowest prices in the nation~GUARANTEED!